Scientists have discovered a warm and rocky "second Earth" circling a star, a find they believe dramatically boosts the prospects that we are not alone. The planet is the most Earth-like ever spotted and is thought to have perfect conditions for water, an essential ingredient for life. Researchers detected the planet orbiting one of Earth's nearest stars, a cool red dwarf called Gliese 581, 20 light years away in the constellation of Libra. Measurements of the planet's celestial path suggest it is 1½ times the size of our home planet, and orbits close to its sun, with a year of just 13 days. The planet's orbit brings it 14 times closer to its star than Earth is to the sun. But Gliese 581 burns at only 3,000C, half the temperature of our own sun, making conditions on the planet comfortable for life, with average ground temperatures estimated at 0 to 40C. Researchers claim the planet is likely to have an atmosphere. The discovery follows a three-year search for habitable planets by the European Southern Observatory at La Silla in Chile. "We wouldn't be surprised if there is life on this planet," said Stephane Udry, an astronomer on the project at the Geneva Observatory in Switzerland. Two years ago, the same team discovered a giant Neptune-sized planet orbiting Gliese 581. A closer look revealed the latest planetary discovery, along with a third, larger planet that orbits the star every 84 days. The planets have been named after their star, with the most earthlike called Gliese 581c. 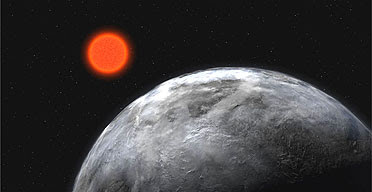 The team spotted the planet by searching the "habitable zone".